This New Jersey-based network of hospitals and other health care services boasts low turnover and offers an on-site concierge service. 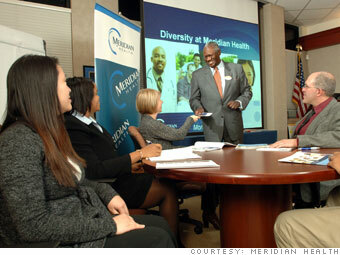 Is Meridian Health a great employer, or what? Job openings (as of 1/7/11) N.A. N.A. : Not available. U.S. employees includes part-timers as of time of survey. Job growth, new jobs, and voluntary turnover are full-time only. Revenues are for 2009 or latest fiscal year. All data based on U.S. employees, except job openings, which are worldwide. These top employers have at least 700 openings each, totaling nearly 137,000 jobs. What are they looking for? Salesforce.com senior account execs take home an average $300K annually. Who else offers big paychecks? These 13 Best Companies reward their employees with some unusual perks. Zumba classes, anyone? From the "Duck Guy" to veggie coach, meet folks who have some of the most off-the-wall gigs at Best Companies. Meet 10 people lucky enough to work for one of the top 10 employers, and see why they love their workplaces. Meet 15 Best Companies that managed to survive the Great Recession while staying loyal to their workers. The developers of Google's mobile OS say they seek top talent that can compromise to create great products. To land a job at the supermarket, no. 24 on the list, show you have a good attitude and win the team's vote. 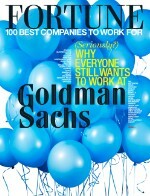 Fortune�s David Kaplan spends a day with engineers at the refinery, no. 30 on the list. CEO Kip Tindell says he looks for confident team players to join his company, no. 21 on Fortune's list.